The latest Bay Area storm was relentless Tuesday in the Santa Cruz Mountains, causing new damage and making already bad situations even worse. Late Tuesday night, the northbound lanes of Highway 17 were shut down near Scotts Valley after a large tree came down, Caltrans said. Crews were assessing the situation as traffic was diverted from the highway at Upper Vine Hill Road. The California Highway Patrol estimated the closure to last about 4 to 6 hours. Tons of debris, including huge fallen trees, awaited Caltrans crews earlier Tuesday as they tried to clear up both sides of Highway 9 near Felton. Motorists looking to head out of town south found the road closed. "At the end of the day, there are two ends to every road," Felton resident Michael Brown said. "You can always go around; you can always take the 17 when it's not covered in mud." Bear Creek Road was even riskier route but apparently did not stop many people from taking it. Half the road collapsed earlier this week, and the county officially closed the road at times. But work crews there say people are moving the barriers to get through anyway. 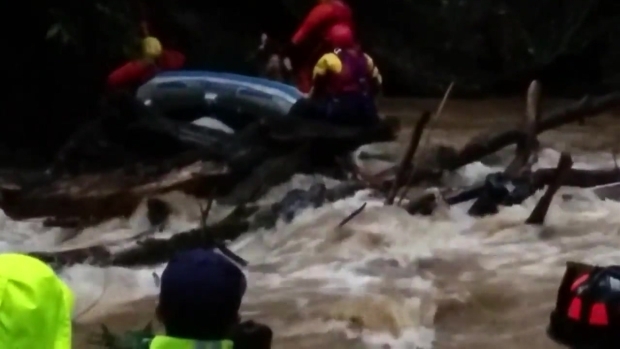 A rafter became wedged in trees and debris amid rushing water in Boulder Creek, but rescue crews were able to pull him out safely. Video by BoulderCreekInsider.com. The road collapse was threatening a main pipeline that supplies water to the Bear Creek neighborhood, where residents on Monday were asked to conserve water. On Tuesday, water district workers controlled traffic while they put in a bypass pipe. One resident called the collapse "scary" and didn't think the road would give way. "I'm surprised it collapsed, honestly," Boulder Creek resident Dan Pruitt said. "It didn't seem that unstable. I'm sure they're getting on it, but I don't know how long it's going to take." 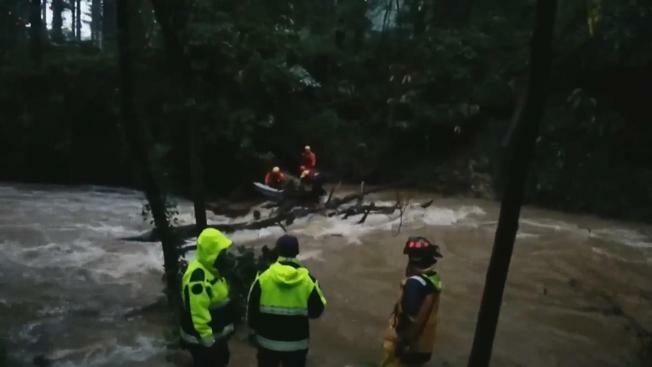 Also in Boulder Creek, rescue crews from the Boulder Creek and Ben Lomond fire departments pulled a rafter out of rushing waters after his raft became lodged in tree branches and debris. There was no word on the person's condition, but he appeared to be uninjured. The situations in the Santa Cruz Mountains are not likely to improve anytime soon with rain continuing to come down Tuesday and Wednesday. Forecasters say the rain should subside by Thursday, providing some relief.